Looking for a superb horse riding holiday that also has time to spend sunbathing and relaxing on the beach? Then join Fantasia Adventure Holidays and escape to the unspoilt Costa de la Luz in Andalucia, Spain! During your week stay here, you will enjoy superb horse riding, relax on unspoilt golden beaches and sample the wonderful Spanish climate. The riding is unbeatable with rides through unspoilt pine forests and along golden beaches. Each day is unique and includes steady canters along sandy tracks and fantastic gallops along firebreaks. Come and savour your unforgettable beach horse riding holiday that feels like a dream come true! 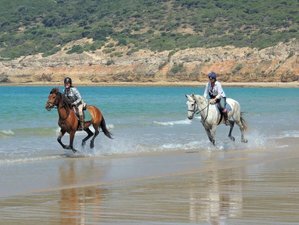 Fantasia Adventure Holidays' eight-day holiday includes superb off-road horse riding on the Costa de la Luz staying in a beach front hotel. During the week you will experience great horse riding and be able to enjoy the adventure of a typical Spanish town. This full board horse riding vacation is ideal for both single and group bookings, groups are kept small and create a great friendly atmosphere. You will meet like-minded people and have new friends by the end of the holiday. Your hosts and guides are the owners of the company, Steve and Caroline. Fantasia Adventure Holidays' aim is to provide a value for money horse riding vacation that is a dream come true. The holiday is stress free with all your needs well taken care of and runs from Sunday to Sunday. The base for the horses is only a few minutes drive from Barbate, and on arrival at the farm you are welcome to groom your own horse ready for riding. If you prefer your horse will be groomed ready for riding for you. Each days riding is different with between four and four and a half hours each day spent in the saddle with a short break part way around. After returning to the farm, your lunch will be taken at a local "venta" nearby, returning back to Barbate between 16:00 and 16:30. The afternoon will then be free for you to spend on the beach, sightseeing, or shopping. The trails provide superb off-road horse riding through the Barbate nature reserve. With direct access to the reserve, you will have fantastic riding through unspoilt forests and unforgettable days on the beach. With long wide firebreaks and twisty forest tracks, the park could have been designed for horse riding. Each day, there will be plenty of opportunities for long collected canters and exhilarating gallops. In-between canters, the pace is leisurely, enabling you to take in the tranquillity of the forest. The topsoil of the forest is sand and the going is good whatever the weather. On beach days, your dreams will come true with the sea and sand extending for kilometers before you. On this week holiday two day rides will take in the beach where you will enjoy a riding experience never to be forgotten. At times, the beach ride will be fast and exhilarating and at other times, it will be mesmerizing and relaxing. Your time spent on the beach will be a mixture of meandering in the surf, gentle canters, and the occasional gallop. Unlike most other horse riding holidays on the Iberian Peninsular, here, you will be able to ride on the beach for 12 months of the year. The law in Spain and Portugal prohibits taking horses on the beach at any time of the year. However, in practice, this law is only enforced when the beaches are heavily used. On the main Spanish coasts like the Costa del Sol, this law is enforced stringently. On the Costa de la Luz, the law is only enforced on busy beaches from the June 1 to September 30. You are lucky as the beaches here are where this law is not enforced. Fantasia Adventure Holidays currently has 14 horses. Two are purebred Andalusian (PRE) geldings and the rest are all Andalusian or Arab crosses (12 Hispano Arab / Anglo Arab geldings and mares), ranging from 14.3 hands to 16.3 hands in size. All horses are grey or bay coloured, originally trained Spanish Vaquera, and retrained to be ridden English style. The horses are well mannered, forward going, sure footed and responsive with a kind calm temperament. The horses are kept in the most natural way possible turned out together. Partly covered by a pine wood, Fantasia Adventure Holidays' farm provides the horses with plenty of shelter from sun, wind, and rain. The horses are brought in each day, fed with hard feed, and checked over. Hay is given ad lib in the fields for them. With this system of horse care, the horses socialize with each other and are a happy family group. On riding days, the horses are turned out to the highest standard, fit, and happy to be ridden. Fantasia Adventure Holidays' standard of horse care is high with the health and welfare of the horses being paramount. One of Fantasia Adventure Holidays' most important roles are choosing the correct horse for you and they have over 20 years' wealth of experience in matching horses to riders. A horse that will be chosen for you will suit your riding ability, experience, and physical size. Fantasia Adventure Holidays has a variety of horses and some suit the less confident rider and others the more proficient rider. Please note that Fantasia Adventure Holidays' vacations are aimed at riders who are comfortable riding a horse at all paces within the varied environments of forest and beach. Fantasia Adventure Holidays uses top quality English saddles and bridles. In addition, please also note that there is a weight limit of 13 stone, 83 kilograms, or 182 pounds. Collection from the hotel is at 09:30 each day. Today's ride leads through the beautiful pine forest to the 17th century Mecca tower overlooking Cape Trafalgar. This introductory ride allows you to get to know your horse, with the faster paces being introduced as your confidence grows. This is your first beach ride. The route leads through the pine forest to the beach ‘Hierbabuena’. You’ll have plenty of opportunities to canter, with a memorable beach gallop. Today, you’ll go to the cliffs overlooking Barbate. The ride has superb views of the surrounding mountains and on a clear day North Africa. Lots of long gentle canters. -Thursday %A day free from riding. An optional excursion to Jerez to visit the Royal Spanish riding school is available. Today, you will head to the scene of the famous sea battle at Cape Trafalgar. Following the coast to El Palmar, there is plenty of beach riding enjoying canters and gallops. On the final day, the ride follows roller coasters of sand and allows plenty of opportunity to canter and gallop. The route joins the cliffs leading to Caños de Meca. Transfer to Malaga leaving Barbate at 07:30 to arrive at Malaga at 10:00. Non-riders are welcome and with plenty to do, the area can be a good base for non-riding vacations as it has many sports available. Public transport is also available and information can be provided on places of interest. You can experience a superb range of activities, have time to sunbathe on the beach and join in socializing over dinner. You can also explore the area from mountain bikes, join a PADI scuba diving course, or Fantasia Adventure Holidays can also arrange a photography course for you. There are excellent golf courses locally and the area is famous for wind and kite surfing. If all you want is relaxation, you can spend the whole week on the beach. As a harassed computer technician and horse owner for many years in the UK, Steve decided that a life change was needed. He first moved to this beautiful and unspoiled part of Andalusia in December 1992 and has been operating horse riding holidays here ever since. With the wealth of experience that he has gained, Steve can offer holidays that provide not only challenging and exciting horse riding, but also a taste of the real Spain. Caroline has been riding from very young and was a horse owner in the UK. She completed her British Horse Society Stages exams 1, 2, and 3 at the Horse Masters Course as well as the assistant instructor exams and enjoyed teaching disabled riders. She worked in the equine industry for several years, in an international show jumping yard, point to pointing, and national hunt racing. Caroline had a break from the equine industry for a while and enjoyed competing on her own horses in her spare time. In 2002, she moved to Spain to join Steve and help run the horse riding company. The base for this holiday is in the seaside town of Barbate on Spain's unspoilt Costa de la Luz in Andalucia. You will stay in the well appointed 3* hotel Adiafa located next to the beach and only a few minutes walk from the town centre. The town has a good bus and taxi service for those wishing to explore the area after the days horse riding has finished. The Cádiz Costa de la Luz is one of the truly unspoiled areas in Europe and is an ideal location for a horse riding holiday with national parks and unspoiled beaches to ride on. As well as being a perfect base for horse riding holidays Barbate offers much more. The town has a beautiful golden beach running for almost two kilometers from the River Barbate to the Marina, ideal for sunbathing. Running the length of the beach is a lovely promenade with plenty of ice-cream parlours, bars and restaurants, ideal places to relax in after riding. The town square is lovely with the town hall and church on either side, and the busy town centre has plenty of shopping ideal for souvenir hunting. The horse riding trails are through a large, pine-forested nature reserve called La Breña y Marismas de Barbate Natural Park. The natural park consists of spectacular cliffs, beautiful woods of umbrella pines, and the marshes of the river Barbate. The park offers stunning views towards the African coastline and also towards Cape Trafalgar and its beaches. It is home to teeming colonies of herring gulls and egrets, along with a stunning variety of wildflowers, herbs, and palms. The park forms what is considered one of the most diverse and best-preserved parts of the Andalusian coast. Fantasia Adventure Holidays' local knowledge is second to none. With over 20 years of organizing horse riding holidays in the area, Fantasia Adventure Holidays will be able to lead you to really spectacular places. Please book your flight to arrive at Málaga Airport (AGP). Transfer from and to the airport is included. Fantasia Adventure Holidays will pick you up from the airport. Flights to Málaga Airport (AGP) are available from most European airports. Transfers from Málaga Airport (AGP) are no later than 2:30 p.m. on arrival (Sunday) and return to Málaga Airport (AGP) arriving no earlier than 10 a.m. on departure (Sunday). Airport: Málaga Airport Airport transfer included: Málaga Airport No additional charges. You can request this in the next step. Fantasia Adventure Holidays offers friendly hassle free horse riding holidays where you can relax and enjoy every moment of your holiday. This holiday is available from September to November 2018 and February to November 2019 with arrival on Sunday. Please select an arrival date below.